5 Piece Set With 8 Foot Extension Pole. Clean And Dust Surfaces 15 Feet High. Keep your ladder in the garage, and don't set one foot on any stool, but still get the job done. This powerful combination of cleaning tools is made even better thanks to the telescoping extension pole that allows you to clean almost anywhere without climbing. The three stage extension can be as short as 36 inches, but it also extends to a full 8 feet when you need the reach. Forget about falling over, or stretching to barely touch, because with attachments in place, and your arm outstretched, you'll be able to reach surfaces a that are as much as 15 or 20 feet away. The commercial grade pole is made from steel, so it's highly durable, but it's not too heavy when fully extended. Four quality tools are included in the package, and each can be used in your hand, or secured to the end of the eight foot extension. 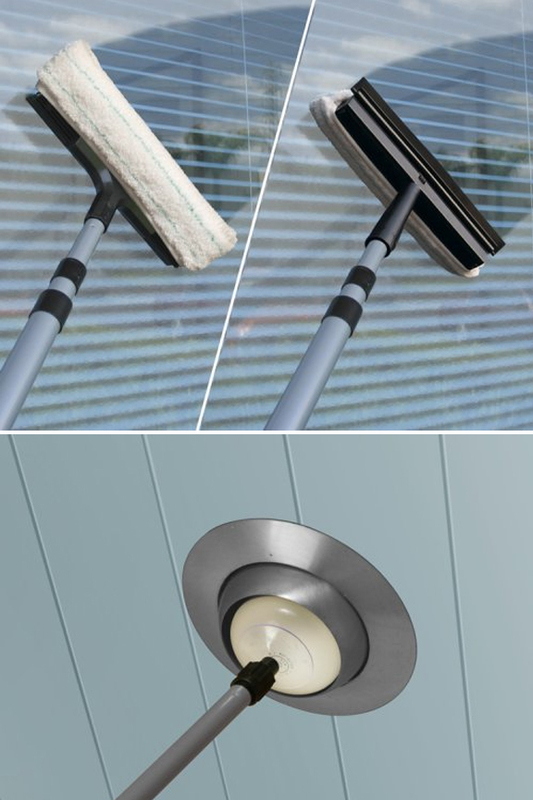 With this valuable combination, all of the hard to reach spots in your home will be cleaner than ever. Eliminate dust from ceiling fans, clean dirt from rafters, crown molding and tall shelves, wash windows and skylights, and even change light bulbs that you can't reach by standing. The top quality components are highly effective, so any job will be simple, and they're also quite durable, so you can expect them to last a long time. Because it features a standard thread, you can even use the pole for other tools you already have. This colorful attachment is a long dusting wand that can bend to any angle. The gentle poly fibers will never scratch anything they touch, and as you use it, a static charge will build to pull in dust. It's perfect for cleaning light particles off any surface, and it allows you to do so without any harsh spray or chemical residue. 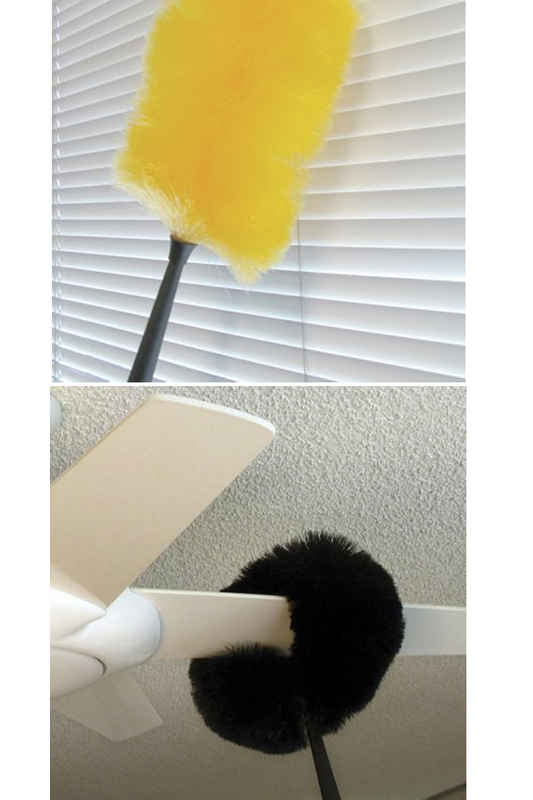 The large tool adds even more length to the already long handle, so no dust bunny will be out of your reach. Quickly clean beams on a vaulted ceiling, or remove dirt from a plant ledge. 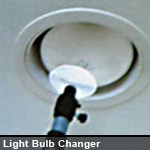 The perfect attachment for recessed lighting, and other high up bulbs. Add this tool to the end of your extension pole to remove and install light bulbs without using a ladder, chair or stool. Simply press down against the glass, and the powerful suction cup will grab on, and hold securely. Now just twist to take out, or re-install. The quick action is safe, effective, and compatible with many different varieties. Large spots or smaller halogens can be quickly swapped without stretching or straining using this valuable tool. The ultimate attachment for those with skylights or tall windows. One side is a sponge and cleaning pad, and the other side is a flexible rubber blade. 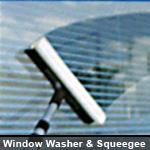 Use with ot without additional cleaner to wipe glass and mirrors to a streak-free shine. The quality design distributes pressure evenly, so all areas get thoroughly cleaned in a single pass. Get professional quality results without paying the bill, and prevent the struggle and cost associated with using spray cleaners and paper towels. 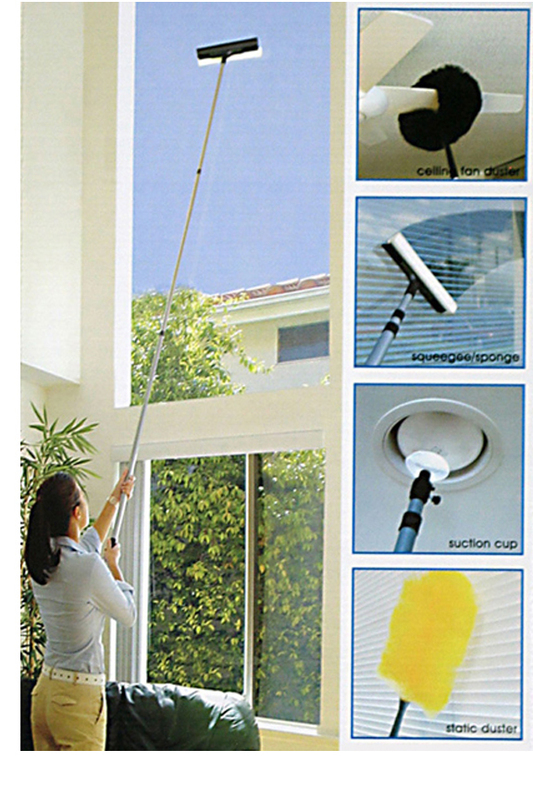 This circular attachment is like a cross between a duster and a cleaning brush. 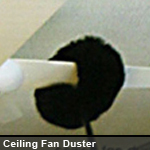 When attached to the end of the extension pole, it provides a powerful tool for removing dirt from ceiling fan blades. You can certainly use it for other stuff too, but when cleaning blades, it works perfectly, and cleans all sides with one easy motion. Simply extend the pole to full length, and no fan will be out of your reach. Slide it back and forth to quickly clean all blades in a matter of seconds. Pole Length 38" - 8 ft.
Reach Offered When holding fully extended, easily reach areas 15 ft or more away. Easily clean high up places without ladders or stools. Order Yours Today! I love all the attachments but the pile is a bit unstable. Would have liked a better pole to track 10 feet plus. I am well pleased with this item. I have high ceilings and walls and it helped reach corners that collect dust and other debris. I do recommend it for high to reach places. I love this set. 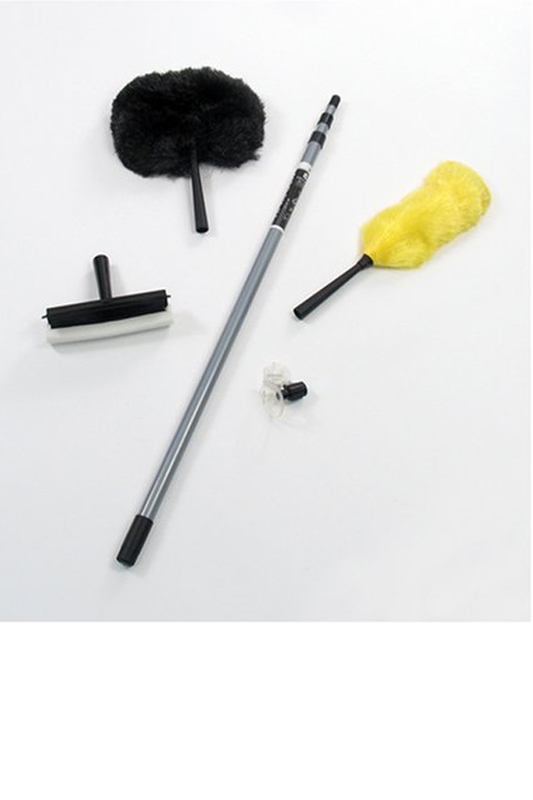 The regular dust wand is just small enough to dust through tight areas without knocking things over. The extender was perfect for getting over the top of all my kitchen cabinets & the dinning room hutch. No more standing on the step ladder. The ceiling fan attacthment is a real plus. So glad I bought this. Just the right weight. Not too heavy and not too light to wobble. Easy to adjust the length. I am enjoying my new high reach duster set, am happy with it. The fan attachment does not fit on my fan blades though, I would suggest making it bigger. I bought this as it was much cheaper than an item on Frontgate. I was very impressed with the quality, it took me a little time to figure out the extension as it was a little tight. Dusting at 20ft no problem- not to sure about cleaning rhe windows as the pole is very flexible. This set can reach up to 20 feet high? This set comes with an eight foot extension pole. Exact reach will depend on the height of the user and what tool is attached. 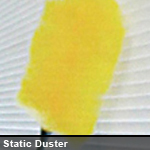 If I buy your kit and need to replace the static duster a few years from now, can I just get the duster without buying the whole set? At this time, the duster from this kit is not sold separately. Mini Duster With Built In Cover. Up To a 20 Ft. Reach! Dust Up High and In Hard To Reach Places. A Money Saving Set. Dust Your Home Faster & Easier. Dust Your Home or Office The Fast & Easy Way.